Source of the post This raises an interesting point as to the affects of time dilation, as I remember reading about that famous experiment involving the ISS astronaut Scott Kelly staying aboard the ISS for 520 days — all of which he spent zooming around Earth at 17,500 mph (28,160 km/h). When he came back do to Earth, he was 6 minutes and 5 milliseconds younger then his twin brother, Mark. So he did come back literally younger, which would be measurable by an atomic clock (regular wristwatches are not accurate enough to measure a 13 millisecond difference out of a year), but not to any extent measurable by medical science. Whatever changes they found in his body had a different cause. Sorry An'shur -- I didn't overlook it, but I don't know of the answer offhand. I may try to figure it out when I have the opportunity. Source of the post I came across an interesting video. I am wondering how could I calculate the orbital period of the configuration at 3:32. This version is also possible. And some others would have to be possible too. Source of the post the binary stars in the video have retrograde orbits. The third example is unfortunately not possible. The star on the middle orbit would have to be faster at both ends of the ellipse, but that is not possible in SE. But here is the fourth version. My version of it. Of course, SE can not produce egg-shaped orbits. JackDole, Yes, the third example seems impossible, at least not with one epicycle. I attemped it, but the planet is slowest near the ellipse focal points. If you imagine the epicycle's (I used a barycenter) orbital period to be 1 and that of the planet -1, then you get an ellipse with the Sun in the center. 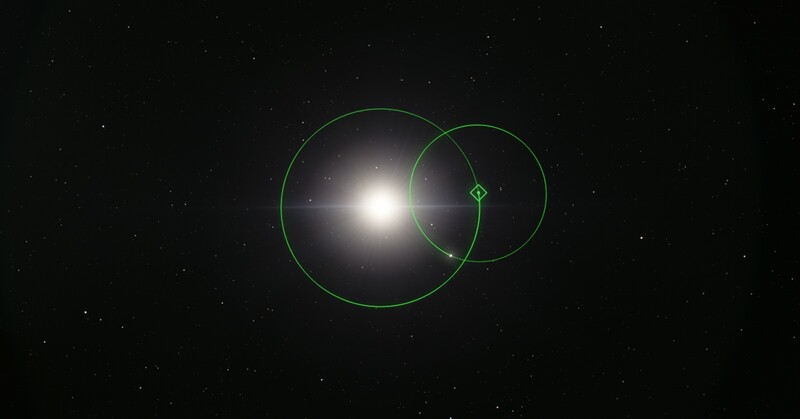 If both semimajor axes were of the same size, the planet would move on a straight line and pass through the star. Sorry, I was lazy gif-maker refused to work, so here is a screenshot. Fourth example is cool! Not egg-shaped but sufficient. I do not aim for 100% accuracy, since realism gets thrown out of the window anyway with all of these orbits, since they are unstable. An'shur, I have a version of the third example. But as I said, the speeds are not right. And you can see the second (wrong) Barycenter if you have orbit lines on. Will the Venus encounters have enough gravitational energy to slow it down enough to eventually "touch " the sun's corona? Will these Venus encounters occur without course corrections? Sorry if my question(s) are dumb. Source of the post Will the Venus encounters have enough gravitational energy to slow it down enough to eventually "touch " the sun's corona? 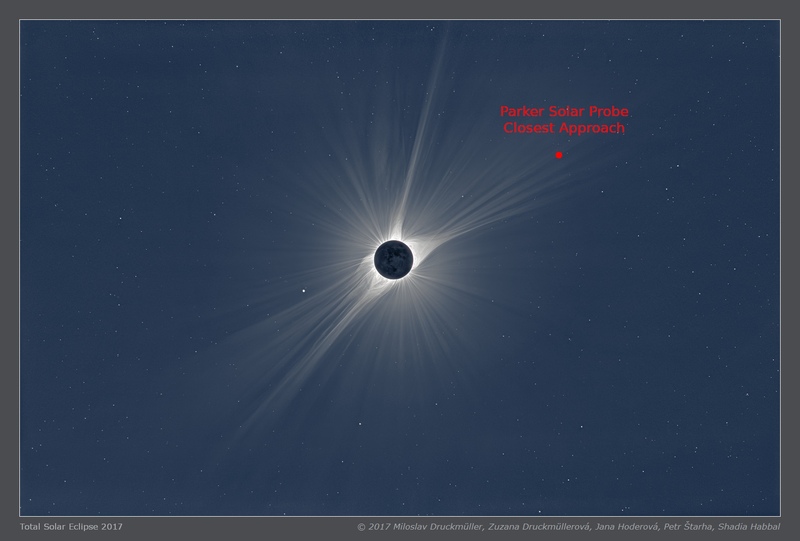 The Sun's corona doesn't really have a hard limit to it, but rather smoothly transitions into the solar wind, filling the whole solar system. In a sense, aurora are particles from the Sun's atmosphere slamming into Earth's atmosphere. This should definitely be close enough to get really interesting direct data. Yes. I felt a need to copy in something from Sunshine here. Appropriate. I had mixed feelings for that movie, but the music and visuals were sure awesome. Nice first half. Second half, terrible. I read a question posted somewhere today about the Parker Solar Probe today which I *think* was meant as a funny joke, but it's hard to be sure. It went like: "I'm assuming that the probe will land at night, otherwise it will surely burn up, right?" It went like: "I'm assuming that the probe will land at night, otherwise it will surely burn up, right?" I'm going to have to remember that one. My astronomy club can get a bit too serious otherwise. Is anyone here on the forum familiar with the computer program called StarGen (link:http://www.eldacur.com/%7Ebrons/NerdCorner/StarGen/StarGen.html), a program that simulates solar-systems around other stars based on the scientific papers of astronomers including Carl Sagan, and Stephen H. Dole, down to all the last detail, including atmospheric components? A complete history of the program and its methods can be found on the StarGen website, along with some info on "Accrete" HERE. I found the program quite interesting to use and study, since its algorithms are based largely on work done by Stephen H. Dole, as mentioned earlier, who was the former head of the RAND Corporation's "Human Engineering Program". RAND had a number of eminent scientific consultants including John von Nuemann (among others) for their various projects, and I think needs no introduction to the community here, but if you are curious, the company website is here. Dole is the author of several books and papers, eminent among which is "Habitable Planets for Man" , a classical book written during space race I would highly suggest to any interested in planetary formation theory, planetary properties and a given planets habitability for modern homo sapiens sapiens (if you have not already). The book is a bit dated as far as astronomical discoveries go, but RAND published a new edition on its 60th anniversary that has some revisions and is fairly cheap to buy or download. My questions are: are the techniques and algorithms presented by Dole, among those analyzed by Sagan, Isaacson and those utilized by StarGen, used in SpaceEngine, obviously with some adjustments to make room for original coding and new discoveries? Are they useful or viable? What do you think of Stephen Dole's work and has it held up reasonably well? Should I direct this to the attention of a SE team member? If they do use similar codes, then no harm done - If however they are completely unaware of Stephen Dole's work and the subsequent program it generated then it might help SE if I mention it .